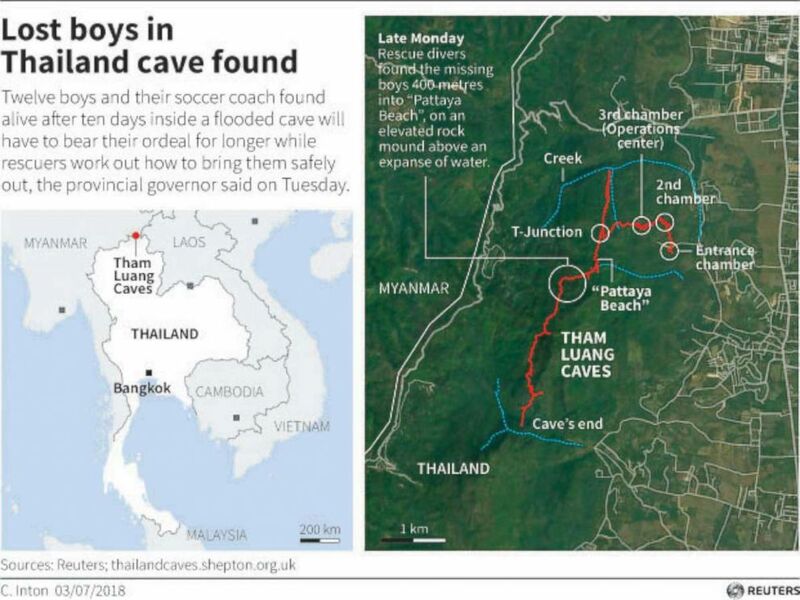 Jubilation turned to trepidation Tuesday as rescuers faced the daunting task of figuring out how to extract 12 boys and their soccer coach from a jungle cave in Thailand where they were found alive after being trapped by floodwaters for 10 days. Officials cautioned that the rescue is not complete and could take "weeks or months" before the once-wayward group is removed from a sweltering subterranean labyrinth full of perilous twists, narrow passages and completely flooded areas that even well-trained Navy SEALS found challenging to maneuver through. 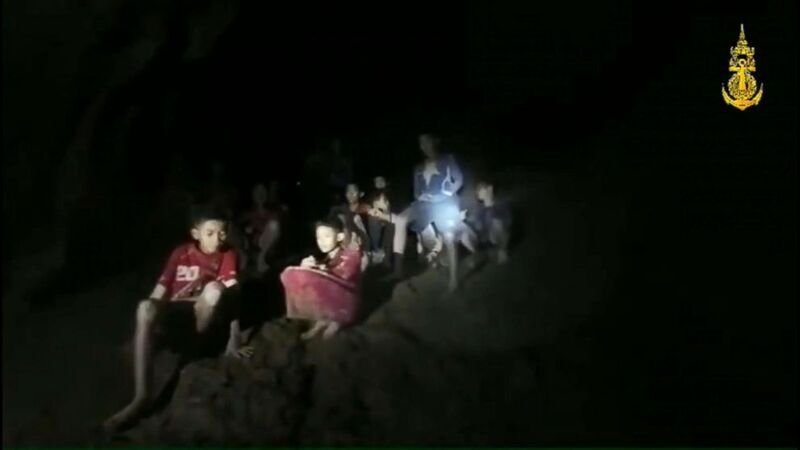 (Royal Thai Navy SEAL) A light illuminates members of the soccer team found alive in a cave in Thailand as rescue workers locate the missing boys and their coach, July 2, 2018 in Khun Nam Nang Non Forest Park, Thailand. "We need to be careful not to rush; as long as they are safe and strong, then they are in good hands," Thai Prime Minister Tryut Chan-o-cha told reporters. "We can now reach and communicate with them, so they are in our sights." Technicians were working to install a phone line so the boys can talk to their parents. They expected the communication line to be up and working by Tuesday night. The boys, ranging in age from 11 to 16, and their 25-year-old coach, were discovered Monday in a cramped but dry chamber of the Tham Luang cave they entered on June 23. 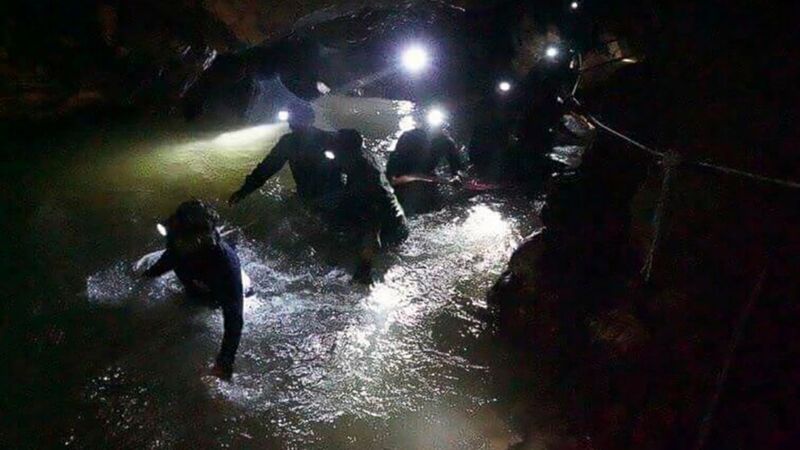 The team became trapped when monsoon rains flooded passageways, cutting off their exit routes and forcing them deeper into the dark burrows in the mountains of northern Thailand. Rear Admiral Arpakorn Yookongkaew, a Thai Navy SEAL commander, said a team comprised of seven SEAL team members, a doctor and medical science nurse are now with boys and their coach, assessing their conditions. "We have given the boys food, starting with easily digested and high-powered food with enough minerals," he said. All options of how to remove the 13 from the cave were being explored, including training them how to scuba dive in case rescuers have to lead them through the treacherous two-mile route they took to find them. It took a dive team six hours of trudging through mud and silt, diving through flooded areas and climbing through narrow crevices to reach the lost party, officials said. "It's one of the plans," Yookongkaew said. "But if we are using this plan, we have to be certain that it will work and have to have a drill to ensure it's 100 percent safe." (Lillian Suwanrumpha/AFP/Getty Images) Family members celebrate while camping out near Than Luang cave following news all members of children's football team and their coach were alive in the cave at Khun Nam Nang Non Forest Park in the Mae Sai district of Chiang Rai, Thailand, July 2, 2018. U.S. Air Force Capt. Jessica Tait of the 353rd Special Operations Group that was dispatched to Thailand to help in the rescue said the option of having the boys scuba dive to safety was fraught with risks. "This is probably some of the most difficult type of diving there is, really," Tait said Tuesday on ABC's "Good Morning America." But Tait said the boys and their coach have already shown they possess "that mental will to live." Anmar Mirza, a coordinator for the U.S. National Cave Rescue Commission, who is not part of the search party, agreed with Tait that the option of having the boys scuba would be an arduous undertaking. "Cave diving is a very technical skill and it's extremely dangerous, especially for an untrained diver," Mirza told ABC News. "So they may end up being better off trying to supply them in the cave until they can be gotten out by other means." Authorities are also combing the areas outside the cave where they might be able to drill an escape route to pluck the survivors to safety. Construction equipment that could be used to create a path large enough for the boys to escape was sent to the site, but actually drilling a large enough shaft could prove challenging and take quite some time. The boys and their coach were "located in a relatively small space and this would make any potential drilling attempt as a means of rescue very difficult," the British Cave Rescue Council told The Associated Press. (Tham Luang Rescue Operation Center via AP) Thai rescue teams walk inside cave complex where 12 boys and their soccer coach went missing, in Mae Sai, Chiang Rai province, in northern Thailand, July 2, 2018. "We worked so hard to find them and we will not lose them," Chiang Rai provincial Gov. Narongsak Osatanakorn told reporters. He said luckily the boys and their coach all appear to be in relatively good shape. "In the field, we would assess the boys' conditions and divide them into three categories: red, yellow and green. With red as a critical condition, yellow as serious condition and green as stable condition," Osatanakorn said. "With our informal assessment, we found that most of the boys are in green condition. Maybe some of the boys have injuries or light injuries and would be categorized as yellow condition. But no one is in red condition." Staying in place may be the safest option for now, authorities say. The boys and their coach could be supplied with food and fresh water as the water level in the cave drops, either naturally or by pumping out water. The Thai Navy already is delivering supplies in a similar manner and exploring the cave to gauge its safety level. There are dangers of staying put, however. Heavy rain forecast for Wednesday could raise water levels and complicate future extraction missions. Thai Interior Minister Anupong Paojinda said Tuesday that the boys may need to swim out using diving equipment ahead of the bad weather. 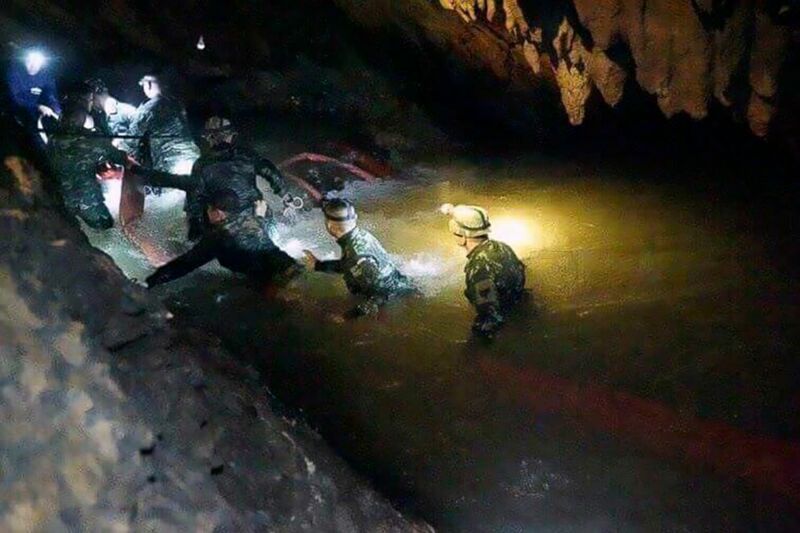 (Tham Luang Rescue Operation Center via AP) Rescue teams walk inside cave complex where 12 boys and their soccer coach went missing, in Mae Sai, Chiang Rai province, in northern Thailand, July 2, 2018. Glyn Davies, the U.S. Ambassador to Thailand, said the United States is ready to supply resources to complete the rescue mission. "We will continue to support Thai authorities in their relentless efforts to bring the 12 players and their coach safely out of the cave and reunite them with their families and friends," Davies said in a statement. 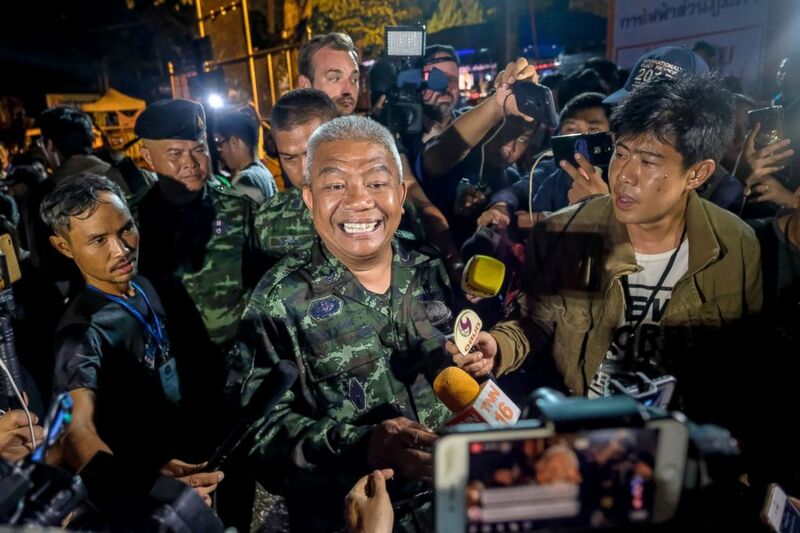 (Linh Pham/Getty Images) General Bancha Duriyaphan speaks to the press after the 12 boys and their soccer coach have been found alive in the cave where they've been missing for over a week after monsoon rains blocked the main entrance, July 02, 2018, in Chiang Rai, Thailand. Divers Richard Williams Stanton and John Volanthen, members of the Derbyshire Cave Rescue Organization in Great Britain, were the first rescuers to reach the stranded party on Monday. A video posted on Facebook by the Thai Navy SEALS show Stanton and Volanthen speaking to the group, telling them help was on the way. "How many of you?" one of the British divers is heard saying. "Thirteen," one of the boys answers. "Brilliant," one of the divers responds. Officials said the divers gave the group military food rations, including chocolate chip cookies and chocolate covered beans, to tie them over as they waited for more supplies to arrive. (Linh Pham/Getty Images) Relatives of the missing boys pray, after the 12 boys and their soccer coach have been found alive in the cave where they've been missing for over a week after monsoon rains blocked the main entrance, July 02, 2018, in Chiang Rai, Thailand. 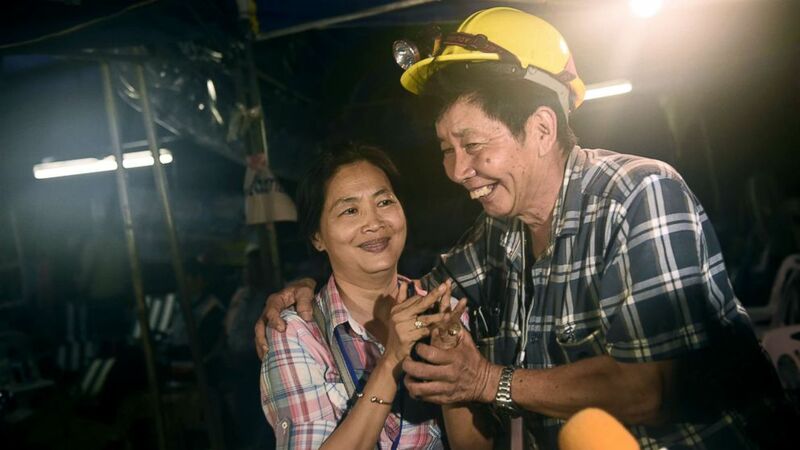 When word that the boys had been discovered alive reached a base camp near the mouth of the cave, joy, relief and cheers spread through the Thai-led international rescue team of about 1,000 people from China, Japan, Britain, Australia and the United States. 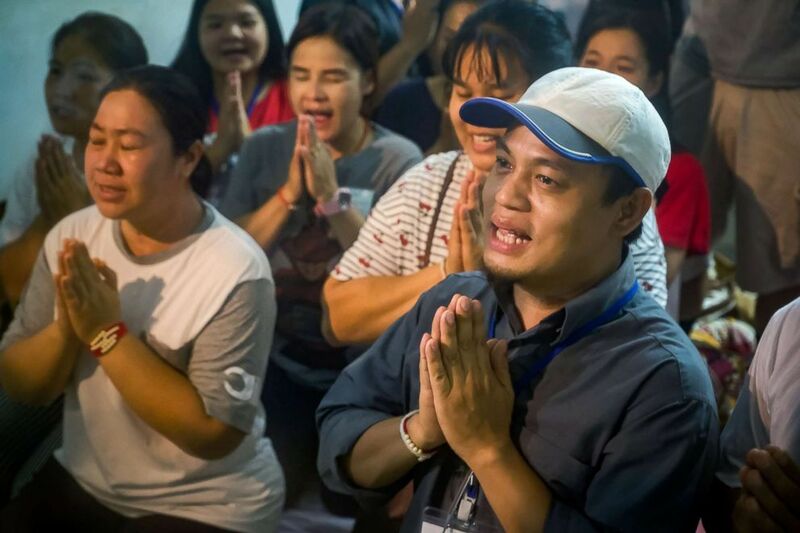 "The successful incident last night brought joy to the nation and the world," Thai Prime Minister Chan-o-cha said Tuesday. "I think this serves as a lesson in rescue operations and in lifting the standards of safety for our people in all sectors -- the government, private sector and civilians. We can see cooperation in many aspects from all involved."